A while back, Dad and I went to see the first one. Today, we went and saw the second one. The graphics were very good; the computer-generated baboons were realistic enough to not be distracting (which is tough). It has to be hard to try to create a sequel that keeps the promises and fulfills the expectations that the prequel creates without feeling like an unnecessary "hey, the last one made money!" rehashing of the same old stuff. 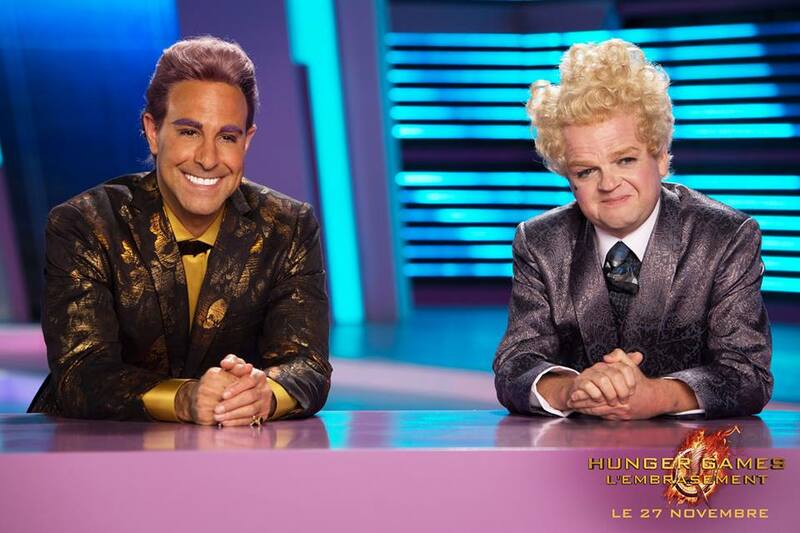 The team behind Catching Fire did a passable job doing so. While the scenes in the arena got a bit long in the tooth at a few points (monkeys instead of dogs, poisonous fog instead of Tracker Jackers, yadda yadda), there was enough newness to the story to still keep the film interesting, enjoyable, worth watching more than once- and certainly enough to catapult into another sequel (but only one more, please). Speaking of the newness, I really enjoyed the interplay between tributes; lots of very interesting and engaging stuff there; it was fun watching people who would seem to be bad guys turn out to be good guys in the end, and while I saw most of it coming, it was actually kinda nice how it was hinted at throughout the film instead of going for the rather cliché, totally unforeseen twisty conclusion. The arena design was very impressive. Unique and interesting. That place would make a very fun playground. The music (James Newton Howard) was very good, as usual. His composition style is very tasteful and almost dream-like in its smooth simplicity, and it fits the rough, almost surreal wold of The Hunger Games very well. I did notice that the score sounded very similar to the first one, and while I enjoy continuity between films I would like to hear at least a little bit of variety. But the scene with the kettle drums during the procession- A. Mazing. The costume design was excellent, and while many films have excellent costume design that is hard to notice because it is so excellent, Catching Fire does not suffer from that problem. The acting was all good, but this time around I was more impressed with Josh Hutcherson's abilities as an actor than I was in the prequel. Jennifer Lawrence also did an outstanding job, and, since she is the film's central character, she had plenty of time and a huge variety of situations in which to display her acting abilities. The variety of characters was nice, and the filmmakers managed to make the list of tributes in this film zany without being (very) cheesy. Having a tribute pool that wasn't made up of just teenagers was also very nice. That said, it would have been nice to see more interaction, more inter-relational story- more Dickens. We can get deeper than flirting and petty quarrels. I will be addressing the romance issues in the worldview section below, but seriously, please, enough of the kissing and drama and stuff. That's not what I came to the film for. There were some moments of cheese, too; manufactured crises and miraculous solutions that pushed the limits of believability. Combine that with "I almost lost you" romantic goop and it was definitely not helpful to the story. As I mentioned above, at some points the film got a little old, because I had seen it before in the prequel. The obligatory arena action stuff was far less engaging than the political espionage b-story. THE CREDITS MUSIC. DAAAAAAAAAHHHHHHH. WHY. WHY. WHY?!?!?!? I have three more words to add regarding the credits music. James, Newton, Howard. I really enjoy the socio-political commentary that The Hunger Games provides. ...to the power of fear, hope, and the smallest symbols used wisely. Eventually, the tyrants who put themselves in the place of God will be dethroned. I'm really enjoying watching that happen in the world of Panem- and I'm also enjoying watching it happen at every stage in history, and continue to happen today. This film provides a powerful and self-conscious example of the communicative power of aesthetics- down to the clothes that we wear. It all sends a message. Peeta seems a bit more manly this time around; less dependent on Katniss to take the lead, and more decisive and in charge. It still would be nice to see him kill a few more baboons or something, though. Katniss showed a good deal more selfishness and weakness in this film, and while I wouldn't consider those admirable qualities, it was nice that the film is not presenting the "teenage heroine who fixes everything through her super-genius-overwhelming-beauty-physical-prowess-invincibility-in-combat-amazingness." Katniss seems real. After watching the first film a few times, I began to like her a little less. In this film, while not really becoming more likable, she became more lovable, because we got to know her a little more and see her struggles. Catching Fire seemed to push the content envelope, if not intentionally, certainly noticeably. The bleeped-out F-words, the scene in the elevator which provided me with wonderful opportunities to study the theatre wall, and the statement about being an object of public lust were all a bit unexpected after the complete lack of such content in the first film. Any review of The Hunger Games, I or II, would be remiss if it failed to address the problem of the killings. It seems that the thought never crosses anyone's mind, even in the midst of uniting against the Capitol, that "hey, we could just, like, not kill each other!" While we still see remorse and concern for the taking of life, we don't see anyone really refraining from taking life because of that remorse or that concern. Killing people is just kinda assumed. The ethical question of "why not?" which the first film failed to answer finds no more resolution now than it did in the first; if there is no God, there's not really any reason or rule for any of the ethical decisions presented in the film. Also, Peacock-boy needs to put a shirt on... and a few ladies in the film could benefit from doing the same. The skin-tight clothing craze is something I'm quite tired of, speaking of modesty (I'm looking at you, Marvel. You too, DC.). Karate masters have done über-demanding physical feats for years in loose, flowing garments. If our filmic heroes were really that good, they could do the same. Aside from being a teen-centric, love-triangle-infused drama, The Hunger Games and Twilight have at least one other thing in common- they both found a convenient and justifiable way to get the heroine and a very good looking guy her age sleeping in the same bed. For Bella, well, she was cold. It was necessary for her health. For Katniss, well, she was scared. It was necessary for her sanity. Which brings me to one of my biggest problems with this series- a problem which I failed to address in my review of the first film. The world of The Hunger Games is built on a very implausible, very carefully constructed set of assumptions and events. Every year, one teenage boy and one teenage girl from each district is chosen at random, put on public display and worshiped as demi-gods, and then thrown into a giant computer game in which they must kill each other or be killed- all without any choice on their part. This provides a field-day for the teenage imagination, and the most dangerous part about it all is that given the circumstances, anything imaginable is pretty much justifiable. You can pretend to be in love with whoever you want, because it might save your life. You can kill people, because it's self-defense. You can be alone with the woman of your dreams day-in and day-out because hey, you're from the same district, and you need each other. CPR and cleaning the blood off of her face (gently and tenderly, of course) and tearful embraces are all fair game. You have to stay with her all night, because she's scared, and she asked you to, and what kind of jerk says "no, grow up and get over it"?!? And technically, it's true; if I am by some act of Providence stuck on a desert island with a young woman my age who stops breathing, I'm not going to forgo doing CPR because it might ignite the fires of passion. Goodness. Grow up and help the girl. So with the rest; self-defense is Godly and Biblical. Putting on an act to save lives is perfectly fine, as the Hebrew midwives can attest. But God bringing those situations to pass in His Providence is one thing. That might happen, oh, once in a million teenagers, and when it happens, we can act in wisdom under the guidance of Scripture like responsible adults. That's a far cry from building the perfect fantasy world in which the hormone-filled romance-hungry teenage mind can lawfully do all those things which we'd just love to be able to get away with if the situation arose. That's a very dangerous thing. Dear Christian young people, we cannot allow Hollywood to set our thought patterns. Taking every thought captive to the obedience of Christ is not just about not thinking bad stuff- it's about thinking good stuff. Daydreaming about rescuing Katniss or being rescued by Peeta, being worshiped by the upper crust of society or followed by the rebels who need a leader- it's a waste of thought-time that needs to be redeemed. There's a real world that needs leaders. Hollywood puts out a steady stream of opportunities for us to find temporary emotional satisfaction in... whatever. Be a fan. Watch another movie. We don't have the time to do that. There's a war on. And we certainly don't have the time to let the time spent watching movies leak into our daydreams and thereby spend even more time watching movies- this time, with ourselves written into the script. Saving Mr. Banks was better, but Catching Fire was an acceptable sequel to the first film in the series, and certainly left me ready to watch the next one. Nice review, Gabriel. I think this current trend of dystopian tales have been flawed by the sappy and over-the-top romance. I love the worlds. I love the plots (THG, Uglies by Westerfeld, Divergent by Roth, etc). They are unique and wild and gritty, and they require growing up and a toughness that today's society is sorely lacking. But this neediness for someone to smooch or cuddle with every time they're feeling insecure is firstly pathetic and sappy, and secondly, not only a message that undermines the plot of the story, but is contrary to the Bible's message of finding comfort and taking refuge in God. But anyhow. I'd be interested to see this one as I've since seen the first one, but I'm not about to swept up into the obsessed fandom. Fantastic review Gabriel. I agree with all points. Yes! The biggest thing I was thinking after the tributes joined hands was the fact that they forgot their unity once in the arena. But that was the cleverness on the capital's part. The tributes weren't allowed to think this way for long because once in the arena, survival hit home and all revolution was forsaken. It's been interesting seeing how different Reformed, home-schooled young people have responded to the Hunger Games. I'll admit, I haven't seen the movies, but I read the first book right before the first film was released in theaters. I thought that it was a thought-provoking story, but I had an issue with the message. It seemed like the author was ALMOST right... but in her absence of God in the story, she stopped one step short. She showed the depraved culture of Panem, but there wasn't any reason WHY it was wrong. No ultimate authority beyond our comfort zone being invaded, and people not being treated "fairly". It's a tough issue. It's a tough story. And by all means, we desperately need to be woken up from our comfortable entertainment-driven lives, and realize what society can become without a Biblical foundation. But, there are different ways to say the message that needs to be said. I haven't heard much discussion on what people can take away from the story - it's all about the romance and adventure. It would be wonderful if someone could write a book from a better worldview, showing the wickedness of a culture apart from God, but without unnecessary junk. I've yet to see a good book showing that. 1984 by George Orwell was fascinating, but again it had some issues that can't be overlooked, even with its good message.